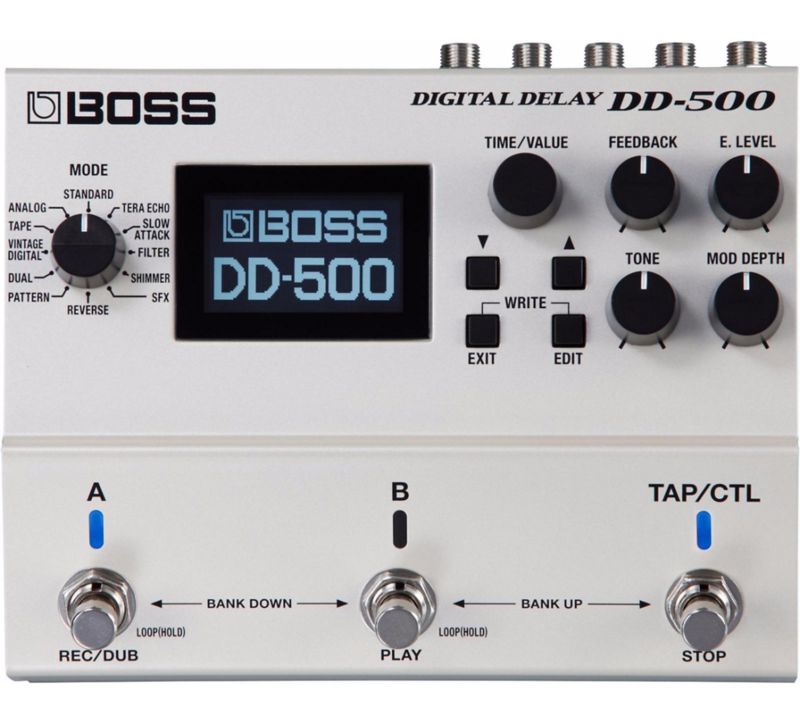 The DD-500 is a compact, versatile delay with 12 modes. This incredible sound-creation toolbox offers 12 distinctive delay modes with exceptional audio quality, plus deep editing controls, a graphic display, patch memories, MIDI, and much more. From basic echo to dead-on emulations of classic delays to incredibly lush spatial textures, the DD-500 will launch your music to places you never thought possible. With the DD-500's 12 delay modes, you can create any delay sound you can imagine, and then some. Everything you need is here, from warm, gritty vintage delays and tape echo to complex modern delay lines that employ pitch shifting, filtering, and other unique processing. With the hands-on knobs, it's easy to shape essential parameters and create great sounds immediately. Each delay type also includes a semi-parametric four-band EQ, modulation, ducking, and many other parameters, allowing you to dive deep and refine tones with maximum precision. In the DD-500, every delay mode has been carefully crafted for a unique sonic personality and highly musical tones at every setting, realized by 32-bit/96 kHz processing throughout. And while the DD-500's delay effects are high-end digital, your straight guitar tone remains 100-percent analog at all times, with your choice of buffered or true-bypass operation. In addition to strengthening the analog dry signal, buffered bypass has the added benefit of enabling carryover, so delay trails are not cut off unnaturally when the effect is switched. 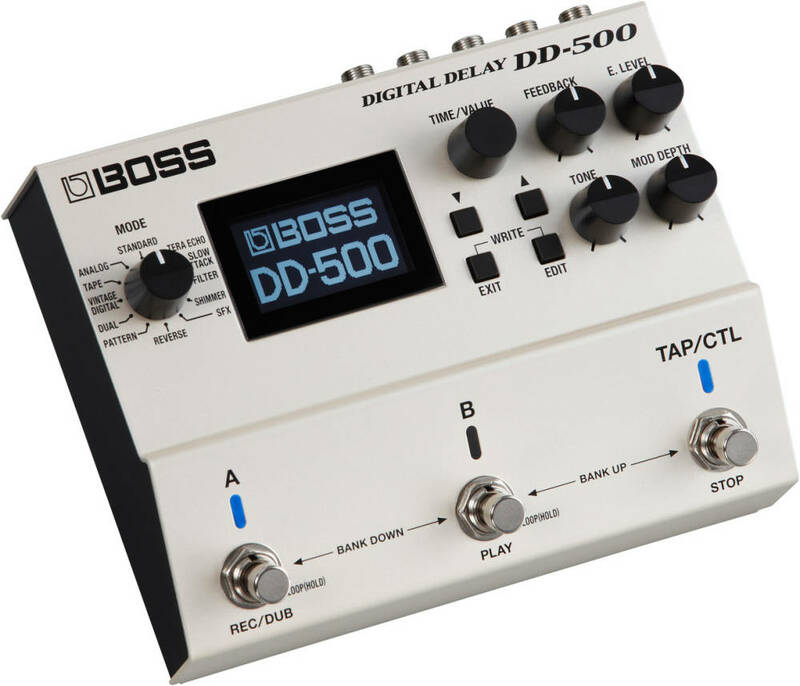 In the world of sophisticated delay stomps, the DD-500 stands apart in practical usability. The large, integrated LCD fully supports the pedal's immense capabilities, giving you clear visibility of delay time, patch ID, and more on one screen, plus sane navigation for detailed parameter tweaks, naming, and system management. And via USB, it's simple to connect to your computer for patch backup and MIDI I/O opens up many additional control options with advanced setups such as a pedal board incorporating BOSS Effect Switching System ES-8. With its freely assignable controls, the DD-500 delivers creative expression and performance flexibility. By default, the A, B, and TAP/CTL switches offer intuitive control for two patches, bypass, bank selection, tap tempo, and more. However, they can be customized to operate in alternate ways, such as providing top-level access to three different delay patches, or allowing you to use two patches at once for layered delay sounds. Instead of tap tempo, you're able to assign the TAP/CTL switch to various real-time functions like Warp or Twist for a wide range of expressive effects. Even more parameters can be manipulated via an optional expression pedal or external switches, and MIDI I/O opens up many additional control options with advanced setups. • Standard - Clear digital delay. • Analog - Emulates classic analog "BBD" delays like the BOSS DM series. • Tape - Emulates the warm sound of tape-based delay units, including the Maestro Echoplex and legendary Roland RE-201 Space Echo. • Vintage Digital - Emulations of early digital delays from the 1980s, including Roland's famous SDE-2000 and SDE-3000 rack units and the BOSS DD-2, the original stompbox digital delay. • Dual - Two different delay lines that can be connected in series or parallel. • Pattern - Sixteen different delay lines that can be set independently for all types of unique rhythmic effects. • Reverse - Backwards delay for cool psychedelic effects and other unique tones. • SFX - "Special effects" delay with a highly unique sound character. • Shimmer - Pitch-shifted delays for lush, heavenly textures. • Filter - Delay with a sweeping filter. • Slow Attack - Ethereal delays that fade in with playing dynamics. • Tera Echo - Spacious, animated ambience effect derived from the innovative BOSS TE-2 pedal. *The product names mentioned in this web page are registered trademarks or trademarks of their respective owners.In this page, these names are used because it is the most practical way of describing the sounds that are simulated. The following functions can be assigned to the DD-500's onboard TAP/CTL switch and/or optional external footswitches. These assignments are stored as part of a patch. • Tap - Set the delay in time with a song's tempo. • Hold - The delay's feedback is held continuously while the switch is pressed. • Warp - Increases the delay's feedback and level simultaneously for powerful expressive effects. • Twist - Adjusts multiple delay parameters with a single press, creating wild sounds similar to twisting the panel knobs in real time. • Moment - Outputs the delay sound only when you hold down the switch. • Roll 1/2-Cuts the delay time to 1/2 of the current setting when you hold down the switch. • Roll 1/4-Cuts the delay time to 1/4 of the current setting when you hold down the switch. • Roll 1/8-Cuts the delay time to 1/8 of the current setting when you hold down the switch. • Fade In-Fades in the delay sound. • Fade Out-Fades out the delay sound. • Assign 1-8 - Allows you to assign and control up to eight different delay parameters at once. 120 sec. (48 kHz/MONO); Delay can be applied. Just an absolute box of treasures to be discovered. Once you get into editing your own delays it really comes to life. an absolute ton of great sounds. Recently purchased this pedal for my rig and love it! Having the ability to tweak pretty much every parameter is amazing. That said, some people feel that too much customization hinders creativity, but I'm not wired that way so bring it on. Boss did a great job on this pedal. I mostly use it with my synths so a true stereo delay was important as well as the ability to tempo synch within my DAW. It checked all the boxes and the price is amazing value as it's considerably less compared to other boutique pedals in this category. No regrets on this one. I absolutely love the digital delay! and now that they have created a pc/mac editor for patches and installed new firmware. I am very optimistic with all the possibilities and the ability to run 4 delays is pretty cool.